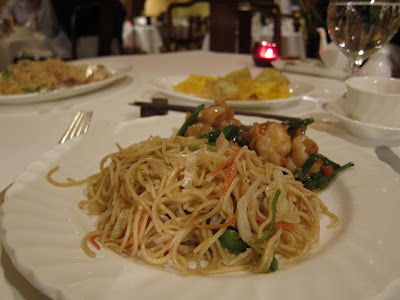 I was back at the Taipan for dinner during another quick trip to New Delhi. 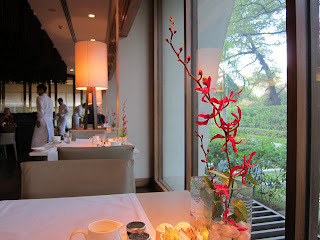 The last time, I had indulged in their excellent dimsum lunch offering. Tonight I wasn't very hungry and decided to have some soup, noodles and a small dessert. 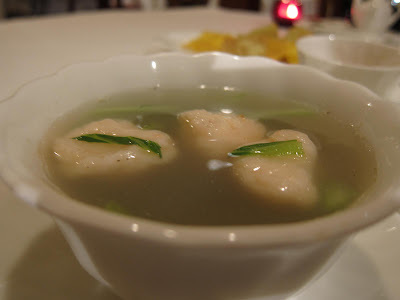 The prawn dumpling soup was steaming hot and tasty, a very pleasant start in the cold Delhi winter. The noodles stirred with greens made for a good combination with prawns and green chillies. 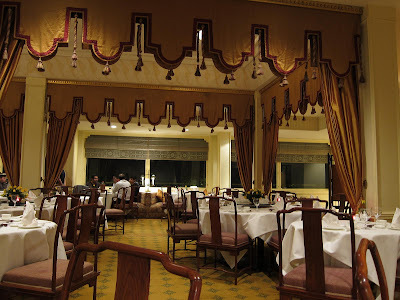 The Oberoi in New Delhi may not have roominess of the newer hotels. 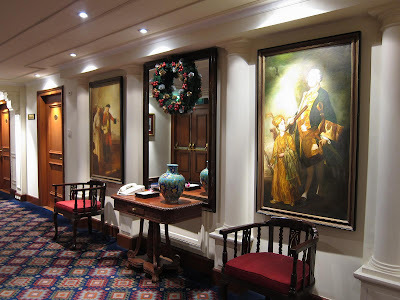 but it more than makes up with its class, old world charm and impeccible service. Even ThreeSixty their all-day restaurant serves up some delightful buffet lunches and a mean platter of kababs and dum biryani. Threesixty has a lovely Indian lunch offering that includes home-made chapatis, a rarity in restaurants. 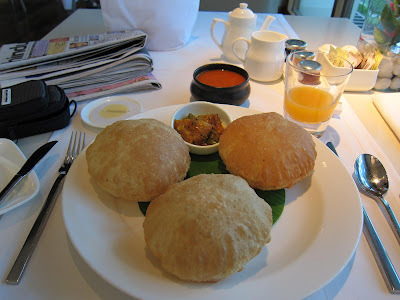 During breakfast, I had to indulge in those incredibly puffed up pooris. 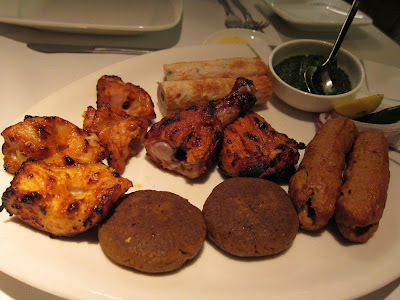 Among the five-star circuit, one of the best buffet lunches I have recently tried was at The Lalit in Connaught Place. 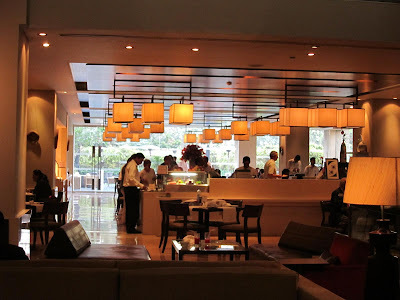 This hotel which has seen multiple names changes in the last two decades, has been renovated with an impressive-looking lobby that has an M. F. Hussain and a Satish Gujral sculpture. The lunch buffet at the lobby cafe is amongst the best I have seen. 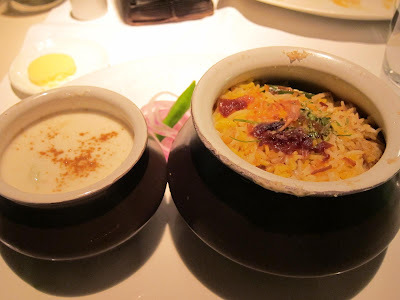 A sumptuous spread of Indian, Oriental and Western cuisine - every dish tastefully created. Not something you find in buffet lunches. 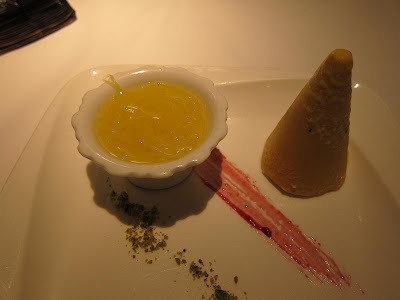 Even the dessert selection was fantastic. Hi Shantanu! Sorry for another long absence, but after a busy start of the year I decided to make a break during the Carnival week, anticipating new hard weeks ahead!! Wonderful shot! If the food matches the decor, it must be superb!! Meanwhile, Blogtrotter 2 (there is a new one...) is in Haiti, waiting for your comments. Hope you enjoy and have a great weekend! !